Factotum is our name, our brand, our everything – but what does it actually mean? • ‘Totem’, the neuter of ‘totus’ meaning ‘the whole thing’. ‘Do the whole thing’, translating roughly as ‘master of everything’. In modern English, Factotum has become to refer to a person having many diverse actions and responsibilities. If there’s one thing that’s true about managing property, you need to be nothing short of an expert in almost anything. 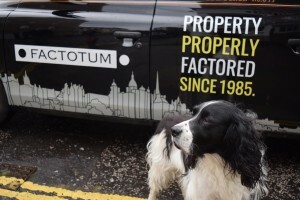 From property repair to legal contracts to dealing with tenants and landlords – no two days at Factotum are the same. A family business, Factotum was founded in 1985 by Sarah and Chris Boisseau. Although the Edinburgh Festivals were in full swing by that point, Festival Letting was not something that anyone did on any sort of larger scale. Starting with Sarah arranging a few lets for friends, the business grew and grew and Chris joined the business full time. Having worked as a property developer and master tradesman for the years up until Factotum, there is absolutely nothing he doesn’t know about building, maintenance, factoring and restoration. That’s why the name seemed absolutely fitting. Masters of property, of factoring, of letting, and of maintenance. We handle it all.